Controller pointer is implemented by WaveVR_ControllerPointer script whose properties describe what the point looks like and what it behave. It is a point at the end of controller beam (e.g. a cube, a blob, a menu item, etc.) to show what object the beam of controller point at. The goal of this script likes the reticle of Gaze to draw the focus of controller beam for user in the VR world. The script WaveVR_ControllerPointer.cs is located in Assets/WaveVR/Scripts/ControllerModel/. The appearance of the pointer is shaped by the material ControllerPointer.mat which is located in Assets/WaveVR/Resources. The controller pointer shader WaveVR_CtrlrPointer.shader is located in Assets/WaveVR/Resources. 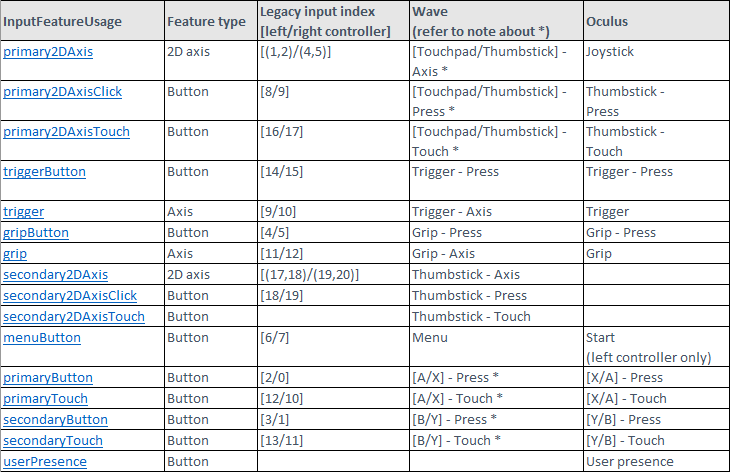 The pointer Prefabs (ControllerPointerL, ControllerPointerR) of controller are located in Assets/WaveVR/Prefabs. Both ControllerPointerL and ControllerPointerR contain the WaveVR_ControllerPointer script component and mesh component with shader. The following is the property list of the controller pointer. Check to show controller pointer, developer can set the value of ShowPointer in runtime. Listen to device, for example, it is Non-Dominant in the picture.